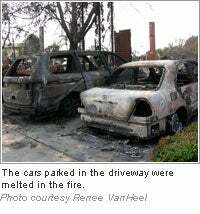 After the San Diego wildfires, Renee VanHeel found herself without a home or office. Now she's back in business and using her entrepreneurial skills to help her cope. For a slideshow chronicling Renee and her family's experience, click here. On the morning of October 23, Cardfinity founders David and Renee VanHeel, while at a family reunion in Minnesota, watched in disbelief as the ABC morning news camera panned across their Rancho Bernardo, California, street and zoomed in on the burnt remains of their two-story home. "We were awestruck," Renee says. "My thoughts went to, OK what does this mean now? We have nothing, not even a vehicle." After the Witch Creek fire tore through northern San Diego County, consuming nearly 200,000 acres and destroying 1,040 homes, it became the fourth largest fire in California history. Lighting up the communities of Escondido, Poway, Rancho Bernardo and Rancho Santa Fe, the Witch Creek fire ravaged through some houses while sparing others. After watching the coverage, David took an early flight home, promising Renee and their three sons there would be a house to live in by the time they got back. In the next few days, he bought a new house two miles from their other residence, canceled all the utilities and began restarting their business. As a merchant credit card processing company, Cardfinity's main operations are done through networking. With all the client data backed up, David had Cardfinity up and running by the end of the week. As he takes care of the business, Renee is devoting her time to piecing the family's life back together. "God has a total sense of humor," she says. "I mean, I hate shopping, I hate filling out forms." These things are what consume her life these days. The tasks range from buying a new toaster so the family can have breakfast to flipping through dozens of furniture catalogs to furnish the house. But she approaches the situation with a sense of humor and an entrepreneurial spirit. Organizing a support group two weeks after the fires is one example of Renee's pioneering attitude. After noticing many single mothers scrambling to get their lives together, she realized, "The hardest thing for the majority of us women to do is accept help. I know for myself it has been a challenge. [But] even the strongest person cannot go through this alone." Calling themselves "The Fired Up Sisters," the women started meeting to share stories and experiences. Renee spearheaded the group's platform for turning "problems into possibilities, obstacles into opportunities." News of the group soon reached Dr. Phil, who invited the women on an episode featuring victims of the San Diego fires. In addition, Renee knew parents who didn't have time to start rebuilding their lives--or spend as much time with their children. Many still have full-time jobs, leaving no time to scratch through the hundreds of small chores and details that came with the fires. So the first night the VanHeels had possession of their house, they opened it up to Young Life, a Christian club at the nearby high school. More than 30 high school students showed up. "Over half of them had lost their homes," Renee says. "There has to be a place for these kids." Renee continues inspiring others to cope with the fires and look at the situation differently. Instead of depicting the situation as all "doom and gloom," she is painting a more inspiring picture. "There will be a lot of good that comes out of this," she says. "We just need to be patient to see it all unfold." However, that doesn't mean it's easy. For Renee, a strong support group is essential. Like any entrepreneur that takes on a new project, "It can be so overwhelming," she says. "If you don't surround yourself with the right people, this is just nuts." While she admits it's a daunting task, Renee sets small goals, such as crossing three items off her to-do list every day and taking on every task "one hour at a time." 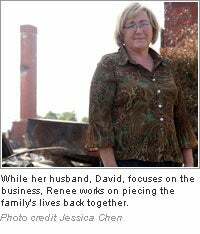 With the dust-yourself-off-and-try-again tenacity of an entrepreneur, Renee doesn't look at losing her home as an end. Instead, it comes as another project that she can and will overcome. With a smile, she says, "This is just another volume in my book of life."